One of the aims of Valhalla is to help reforest the world, starting with Guatemala. In the past 100 years half of the planet's forests have been cut down. As we lose forest cover, the earth loses its ability to fix carbon dioxide, which contributes to increasing the greenhouse effect. This severe deforestation is causing land erosion, loss of nutrition in the soil, climate change and loss of ecosistems vital for the survival of many animal and plant species and the conservation of their irreplaceable genetic material. 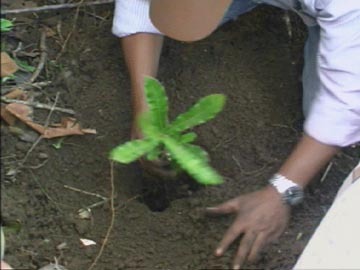 Reforestation with macadamia trees has not only benefits the environment directly, it also affects the lives of the families planting it positively by providing a source of income, permanent employment, and nutrients important to their diet and the development of their children. The Valhalla macadamia nut tree is very efficient a fixing CO2. It has an extensive root sistem, which can help prevent soil erosion. It is easy to grow organically, requires little manitenance and can start to produce in as little as 4 years. It can provide people growing it with a sustainable source of food, an income and even firewood. Becasue of this, Experimental Station Valhlla started its forestry project over 10 years ago. Since then, over 350,000 macadamia trees have been distributed amongst indigenous communities all over Guatemala and experimental projects have started in Honduras. The project is expected to affect positively the lives of the families planting them as well as the environment where they are planted. Valhalla also aim to purchase as many of the nuts that come from these trees as we can, in order to pay growers a higher price. These nuts are then used in our processing plant and sold as finished products, which in turn help pay for the planting of more trees. There are certain limitations regarding the amount of nuts we are able to buy, because our processing plant is very small.